This is an exciting year for Noah Baumbach fans. The release of two films – While We’re Young and Mistress America – was a thrilling prospect. His nuanced characterisation of New York youngsters and their older counter parts, both desperate to maintain their youthful energy and ambitiousness has only blossomed since 2013’s Frances Ha. 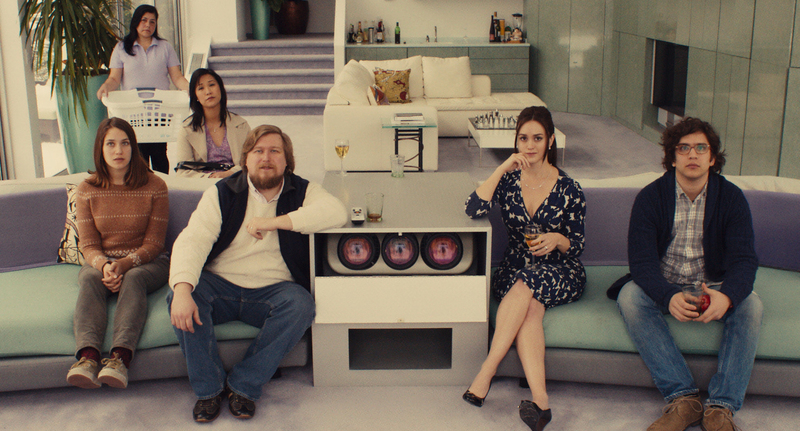 Mistress America only certifies how observant and well-judged his commentary is. Without patronising, Baumbach breaks down the artistic youth and their aspirations in this modern world. Our own assumption that the young (hipsters?) have it so much better is acutely realised and often debunked. While We’re Young toyed with a dual relationship as 40-somethings paired up with 20-somethings. Mistress America, on the other hand, plays with parallels again as 18 year old Tracy (Lola Kirke) is paired with thirtysomething Brooke (Baumbach’s wife, Greta Gerwig, who co-wrote the script). As Tracy explores the world of college (something that fails to inspire her), her mother’s upcoming marriage sets up a friendship with a potential step-sister in Brooke. Brooke tells us how she has lost out on opportunities, as her ‘nemesis’ Clare (Heather Lind) apparently stole her fiancé and an idea (‘hard’ flowers on t-shirts) that made Clare a fortune. But these issues don’t define her – Brooke is on the up. She has investors waiting in the wings to fund a restaurant-come-community-centre. She has her boyfriend, Stavros, in Greece. She lives in a trendy commercial apartment. Keen and ambitious, Tracy adores her. Though Brooke has the confidence Tracy doesn’t, the teenager is more perceptive. She can see the impulsiveness and failings of Brooke and uses it to inspire her own writing, submitting a short story (based on Brooke) to a snobby and elitist literature society in University. Is Tracy, intelligent but perhaps a little naïve, accurate in her assessment of Brooke? And we wonder, will Brooke come out on top, with her hip café idea taking off? These questions, and the simplistic assumption that we merely wonder how things will play out, ignore what captivates fans of Noah Baumbach’s films. The urban cities that pride themselves on ambition and freedom hide a darker secret. The fashionable folks and creative conversations that linger around a pulled-pork stand, in the Hoxton’s or Brooklyn’s of the world, eventually cease and the people go home. As smug as they may look, they too, grow older. The receptionist in a dance theatre, as we see in Frances Ha, has a home to go to. The passionate relationships, who seem to update their Instagrams with where they’ve been a little too often, are fleshed out in While We’re Young. In Mistress America, the flippantly ambitious Brooke see’s the American Dream in every idea she concocts – without realising that there is a small caveat to that meritocratic philosophy. But her confidence is infectious. This is what is such a joy about Mistress America. Like Tracy, we love to be in her company despite all her anxiety and recklessness. But unfortunately we, and the many supporting characters that surround Brooke, judge her. The exhilarating go-getter attitude that defines Brooke isn’t easy to acquire, and behind this relentless exterior is simply a person who wants to be happy, doing what she loves. And isn’t that who we all want to be? Especially when you’re young and lucky enough to study the subject you adore, as Tracy is. Frances Ha, While We’re Young and Mistress America, in this trilogy of conflicted creative pursuits, expertly captures a modern era effortlessly. But Baumbach never fails to include the brutal truth that lurks underneath all the impulsiveness that seems to define so many.